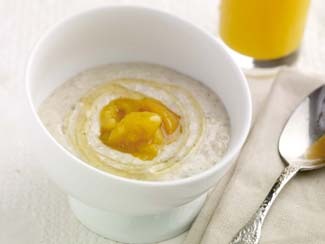 This quick porridge for 2 can be prepared on the hob or in the microwave. In a saucepan, stir 1 cup oatflakes into 2.5 cupfuls cold water/milk or mix of both. Bring to the boil and cook briskly, stirring, for 3 minutes. Flavour, if you like, and serve. In a deep bowl, stir 1 cup oatflakes into 2 cups of water. Place in microwave, but do not cover; cook on High for 2.5 - 3 minutes. The cooking time will depend on the power of the microwave (2.5 mins for 800w or 3 mins for 650w). Leave to stand for 1 minute, stir and serve.